Owner and principal dentist Elizabeth moved to Hervey Bay from the United Kingdom in 2007. She designed and opened Aura Dental Centre in 2009. Her interpretation of what a modern dental practice should be quickly established Aura as one of Hervey Bay’s premier dental practices, winning it recognition as “The ‘Independent magazine’ Health Industry Business of the Year” in 2011 and “the ‘People’s Choice’ Health Industry award” in 2016. 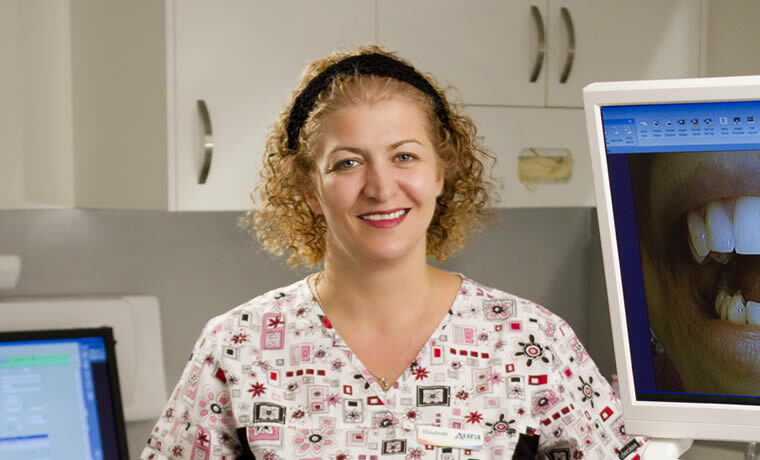 Elizabeth is passionate about communication with her patients and works in all areas of General Dentistry. She also places and restores dental Implants after completing a “Fellowship in Implantology” with the University of Miami USA. She particularly enjoys sharing her wealth of dental knowledge with our younger Dentist’s. Away from work Elizabeth enjoys spending time with her husband, young son and two dogs and is an avid baker and runner. She was proud to complete the world’s largest half marathon “the Great North Run” in the UK in September 2017.